There we were, in Quebec. What a beautiful city. 400 years old, wonderful winding old streets. Laurie and I have been together for 12 years now. We had our first commitment ceremony in August of 1997, and at the time, we didn’t know very many people, gay or straight, who were comfortable using the word “marriage”. Gay folk and straight alike were, at that time, often uncomfortable (for assorted political or philosophical reasons) with the term marriage. I myself like the word marriage. Prettier than wedlock. Handfast is nice — we had a handfast in our first ceremony. Commmitment is what we do when people need to be locked up for the good of self or society. I also like the Mrs. designation. Short for mistress. I’ve never been crazy about “Ms.” It’s not short for anything, and sounds contrived, or like it was created by social scientists. Not organic, anyway. But Mrs. hasn’t always strictly meant married — it also referred to women of substance, property, or independence. You may call me “Mrs. Bosquechica” if you like. At our first wedding, we both wore white, with flowers in our hair. We held the ceremony at a ranch high in the aspens in northern New Mexico. There were 100, maybe 120 people there to share the moment and show love and support for our relationship. Lots of family on Laurie’s side, friends from both. We were married by Julie, a family friend, an ordained minister of the non-specific kind. Lovely ceremony. The Circle A is still at least marginally a working horse ranch, but also a hostel. We rented it for three days, and after the wedding, we had a big reception, a song circle, plenty of food, hiking in the mountains. And on Sunday, Laurie and I drove away and circled the state, starting our own private time as married people. That was ten years ago, and things are different now. I will say marriage as often as I want. I will say my wife, my partner, my girlfriend, my spouse. I think it is a lovely advantage to say “my girlfriend” when we’ve been together so long. I’ve noticed straight married people don’t do that. But really, doesn’t it sound so great? — try it, if you are married — my girlfriend, my boyfriend — like you are still blushing when you think of him/her during your workaday life. Anyway. This marriage, in Quebec. Was amazing and completely different than the first wedding. And now, I am out of time. When I get back from playing on the floor with babies, I will continue . . . The intent to marry must be posted in a public place for 20 days before the intended event. The marriage itself should take place in public, either at the courthouse or in some other appropriately solemn setting. comply with the legal provisions governing partition of the family. You are responsible for taking care of each other, your home and your family. You will contribute equally to that care. Equally may refer to monetary contribution, but may also refer to any balance of work and care agreed upon between you. You are responsible for living together in a shared household. If you cannot afford an independent living situation, you should still live together with extended family as defined by you. You may change your name for social purposes, but for legal purposes, you will retain the same name after marriage as before. What a nice country. What a beautiful thing, to base marriage on the assumption of equality. Wow, I got this feeling we were not in Kansas anymore. 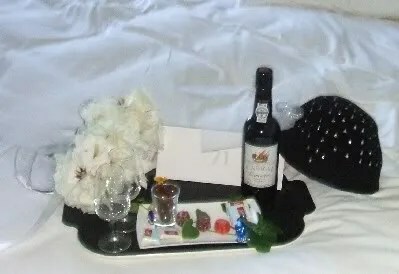 Our hotel staff left this in our room while we were being ridden to the courthouse in procession in our flower-festooned bicycle rickshaws (more later! ), and well, that was one more sweet moment in a remarkable day.